In preparation for a parent seminar on social media I am doing this week, I picked up a copy of Mark Oestreicher and Adam Mclane’s little book Parent’s Guide to Understanding Social Media. I was blown away by this book! It’s a short book (I read it in about 45 min. ), but it’s loaded with facts about social media sites, what teens are doing on those sites, and practical advice for how parents can handle social media when it comes to their teens. 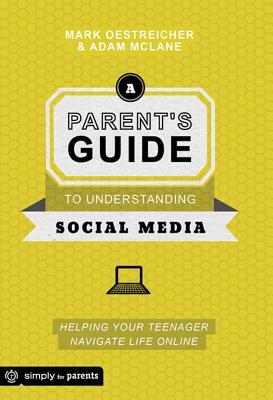 This helpful book informs parents about everything they need to know about social media and their teens. It tells them what social media is all about, what teens are actually doing with social media, the psychological impact of social media on teens, what parents need to remind their teens about social media, and of course practical advice on how to deal with social media and their teenager in regards to their parenting. The main thing I enjoyed about this book and why I would highly recommend it to parents is how Mark and Adam wrote it with preparation in mind rather than protection. “The focus of this book, then, isn’t ‘circle the wagons’ mentality. If you want a book to tell you the internet is evil, you can find that elsewhere. Our goal, instead, is to move from building walls of protection to shaping a focus on understanding social media and earning trust that moves your teenager towards adulthood” (page 8-9). Did you catch that? Mark and Adam says the main goal of parenting is not just protecting your kids, but preparing them to move towards adulthood. I couldn’t agree more. I too believe that parents must move from a mindset of protecting their teens to a mindset of preparing their teens. Click here to read a post I wrote on this topic a few months ago. Another thing I liked about this book was the amount of practical advice Mark and Adam shared. They wrote a whole chapter on practical ways you can parent your teen when it comes to social media. Some of the advice they give is things they did or do with their teens or something they have heard of other parents doing. Either way, they share easy ways to help understand and communicate with your teen about social media. In my opinion, this is a must have book for parents of teens. Teens are on social media networks and that isn’t going to change anytime soon. Parents cannot just hope it will go away and pray their teens use it wisely. Parents need to understand and engage social media in a way that they know what their teens are doing as well as to know how to prepare them for adulthood. Now go grab a copy of this book for yourself! Click here to purchase it for only a few bucks on Amazon.